I hear that question from my students sometimes. My response is generally if you hate carrying a crop, you probably need to carry one more often. It’s the same with the other things we don’t like to practice: no stirrup work, sitting trot…Anything that takes practice to improve. You only get better at ________ by doing it. Going forward. Letting go. Keeping your heels down. Public speaking. Expressing yourself. Saying “no.” If you don’t actively deal with the hard stuff, if you aren’t stepping outside of your comfort zone, and you aren’t pushing yourself to improve. I used to be afraid of public speaking. When I lived in New York City, one of the best things I ever did professionally was take the Dale Carnegie Course. For those who haven’t heard of it, it’s a training program designed to help people learn how to speak to anyone and sell anything. There are a variety of exercises done in groups and in front of the whole class that involve getting comfortable speaking, even if you don’t know your topic well. I was a student for one program, then I was a facilitator for a second one. I can remember my tightening throat, my sweaty palms and the heat rising in my face as I commanded myself to stop saying “Umm” for the twentieth time. But after several months, I improved – and I stopped feeling so nervous about getting up in front of everyone. Now, I’m comfortable in front of a crowd. Even if I mess up, I don’t feel as mortified by my blunders, and I’m ready to wing it if I have to. All because I got up close and personal with my insecurities and verbal clumsiness. My students like to compete. 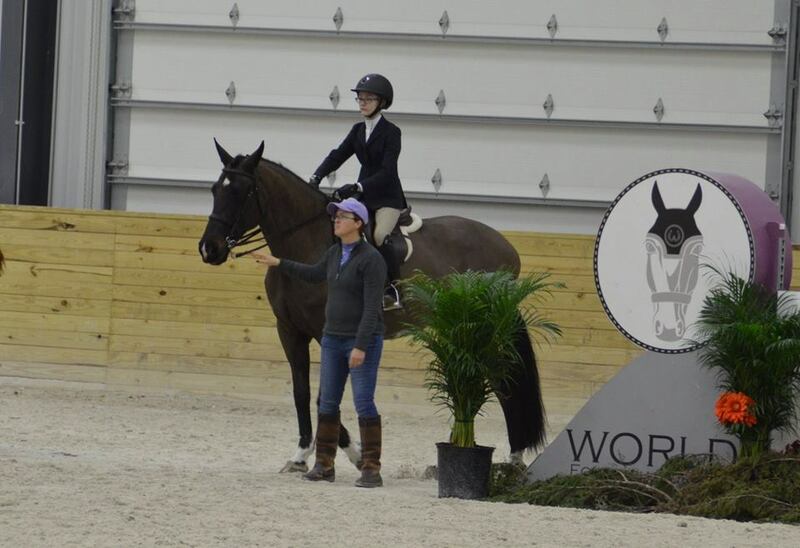 Winning is great, but honestly, if my riders are learning and striving to improve their riding, and enjoying their horses along the way, that’s enough. Showing is the chance to get a status report on your riding. No one is doing it perfectly – even the pros. Our goal is continual improvement. I have some students who are very nervous when showing. My job is to help them stay calm and focused as they learn to treat showing as an extension of their lessons. The goal is to be constructive, to view shows as a schooling opportunity, and to figure out how to think on the fly. When they can work on those things successfully, win or lose, they’ve come out on top. So if riding with a crop is bothersome, keep carrying it until you don’t notice it anymore. If sitting trot is hard, keep at it. If showing seems scary, start small, but get out there. (Make sure you have a good team around you: trainer, barn-mates, etc.). If you have difficulty doing other things in your life, try to break it down into smaller pieces, take a class, read a book, ask a friend for help. Find some small way to push your boundaries and improve those areas. Even the tiniest forward progress will help you stay on the path to becoming a better rider, or a better person, and hopefully both!